Universal Newsline - Business, Lifestyle, Entertainment : Awakening the Nation! “The problem lies with us. We do not ask questions. If you don’t find a proper candidate, it is time we start using NOTA,” is what the foundation Jago Janta Jago of Syed Musharaff suggesting to the masses & hence the decision to promote NOTA. Jago Janta Jago invites the masses to join their voice after Supreme Court allotting a button in voting machines & ballot papers of ‘None of the above (NOTA) & informing them about the benefit of voting by the option for rejecting dishonest candidates in the list. The Rally to create awareness about the new option will see the participation of Doctors, Lawyers, Teachers, Management students & people from all walks of life. 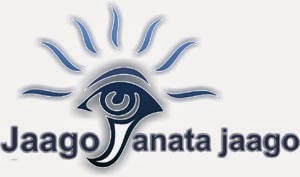 Jago Janta Jago considers it a duty to spread awareness & educate the masses about the pros of casting their negative vote. The very intention of the supreme court of India was to force the political parties to project candidates with clean background as their candidates. The candidates who win the election become a part of the legislature, governing the country. It was, therefore, felt mandatory that candidates with criminal or immoral or unclean backgrounds are deterred from contesting the elections.